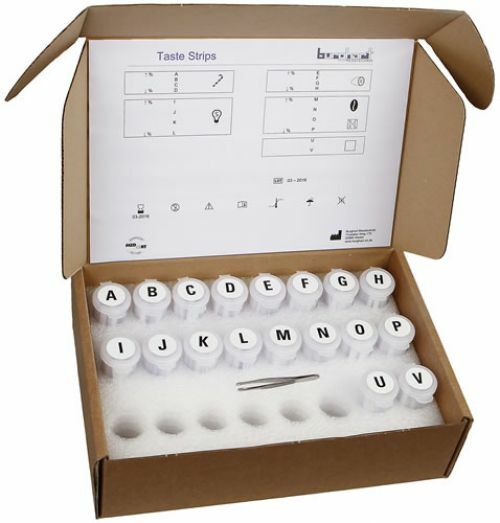 The complete taste strips set consist of 16 containers with 4 concentrations of sweet, sour, salty, bitter each and 3 containers with blanks. The complete set includes 19 containers with 50 Taste Strips each, i. e. 950 Taste Strips in total. The refill taste strips consists of 4 containers in the highest concentrations of sweet, sour, salty and bitter. Every container has 25 Taste Strips, i.e. 100 Taste Strips in total. This test normally is delivered in combination with the Screening 12 Test. The Unami taste strips are an optional addition to the standard taste strips. The set consists of four concentrations of the Unami flavor, per concentration you receive 50 strips. So in total 200 strips. Umami is a Japanese word that means ‘glory’ or ‘savory’; it is one of the five basic flavors, along with salt, sweet, sour and bitter. For a complete assessment of the olfactory function we recommend the complete extended test. The extended test is available in two version. The extended test exists out of the blue identification test (16 pens), discrimination test (48 pens) and threshold test (48 pens). All of the tests will be delivered complete with the manuals, holders and evaluation material. The Burghart extended test is available in two versions. The extended test n-butanol and the extended test 2-phenylethanol. The difference between these two tests is the smell of the target pen of the threshold test. With the n-butanol version the target pen has a alcohol like smell (n-butanol) and with the 2-phenylethanol version the target pen has a rose smell. The rose smell is more pleasant for the patients. The Extended Test was developed especially for the clinic (ENT, neurology, psychiatry, internal medicine, etc.) a detailed examination of the olfactory sense may be performed, e.g. for the preparation of expert’s opinions. The identification test (blue version / purple version), discrimination test and threshold test (n-butanol version / 2-phenylethanol version) can also be purchased as separate tests. The standard tests will be delivered with a manual, evaluation material and a holder. 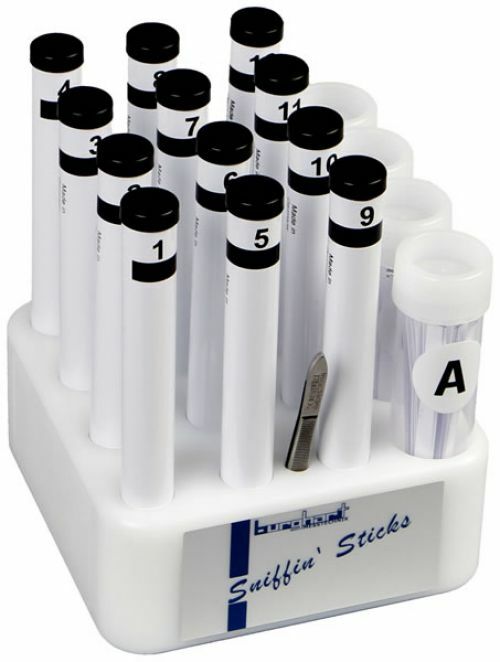 The tests can also be purchased as refill sets without the manual, evaluation material and holder. 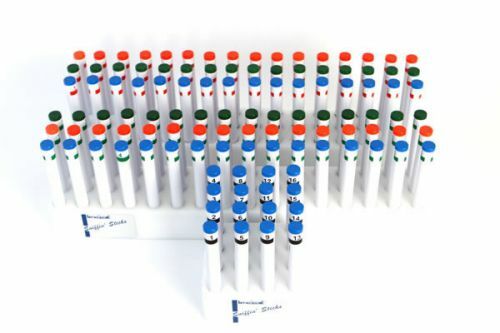 If you want to perform a basic, simple screening of the olfactory function we would recommend to purchase the standard Screening 12 Test.This test contains 12 pens with 12 everyday odors. The Screening 12 Test is developed for the ENT specialist in private practice, neurologist or general practitioner, the question whether the patient possesses a normal or decreased olfactory sense can be roughly answered. Optionally you can also purchase the Screening 12 test with taste strips. With these taste strips (four basic gustatory qualities sweet, sour, salty and bitter) the taste function may be also tested. The evaluation is very easily achieved by means of a template matching the evaluation sheet. The Screening 12 Test and Taste Strips will be delivered with multiple choice cards. For each stick or strip the test person has to choose the corresponding odor and smell from 4 answers. The standard tests will be delivered with a manual, evaluation material and a holder. The tests can also be purchased as refill sets without the manual, evaluation material and holder. How many times can I use the sticks and strips? Each stick is labelled with a best before date, you can use the Sniffin’ Sticks for as many persons as you want before this date. Important is that you use the stick correctly, don’t touch the tip of the pen with fingers or nose. That will contaminate the stick and you cannot use the stick anymore because you cannot guarantee the quality of the odor of the stick. The Taste strips have only been developed for single use. What is the expiry date of the Sniffn' Sticks? Each stick is labelled with a best before date. The expiry date of the sticks depends on the test. The shelf life for the screening 12 test, identification test, discrimination test is approx. 1-1.5 year. For the threshold test this is shorter, approx. 8-10 months. Can I order Sniffin' Sticks with the odor of choice? Yes! You can order single Sniffin’ Sticks. The available odors are: orange, leather, cinnamon, peppermint, banana, lemon, liquorice, turpentine, garlic, coffee, apple, clove, pineapple, rose, fish, flower, pear, cola, lilac, grapefruit, gras, raspberry, honey, ginger, coconut, lavender, melon, peach, mushrooms, smoked meat, chocolate, onion, menthol,soy sauce, sesame oil, caramel and eucalyptus. Please also specify in your order which number the sticks should have (1 to 16 or no numbers), which colour the numbers should have (red, green or black) and which colour the end caps should have (red, green, black or blue). Contact us now for the prices. Can I order empty Sniffin' Sticks? Yes! We can also deliver empty Sniffin’ Sticks which you can fill your self. Please also specify in your order which number the sticks should have (1 to 16 or no numbers), which colour the numbers should have (red, green or black) and which colour the end caps should have (red, green, black or blue). Contact us now for the prices. What do the Sniffin' Sticks contain? The Sniffin’ Sticks do not contain chemical or hazardous components. The odours are made of food products and/ or cosmetic odorants. The delivery time depends on which test you need. Because the sticks have a limited shelf life we do not hold a very large stock. However, most of the times we have the standard tests available from stock. Please contact us for the specific delivery time. Can the Sniffin' Sticks be refilled? No, the Sniffin’ Sticks cannot be refilled: they can be disposed of simply with the remaining household waste. We ship our products worldwide. Please take a look on this page for the actual prices. Is your country not on the list? Please contact us for the costs and expected delivery time. How can I order and pay? You can order the tests through our webshop or you can send us your purchase order by e-mail (info@medi-sense.nl). Please look on this page for the available payment methods.